Perhaps a little bit of a black sheep ratings-wise, the triad of Concept titles released on the PS2 only showcase novelty cars from motor shows held in Tokyo, Seoul, and Geneva around 2001-2002 with the usual "race to unlock" mechanism in place. Of the three, Tokyo-Geneva has the most cars though on the whole the title is chipped off the side of a preceding Gran Turismo 3: A-Spec. Gran Turismo Concept is the first spinoff series in the GT oeuvre, coming after Gran Turismo 3. This trio (2001 Tokyo, 2002 Tokyo-Seoul, and 2002 Tokyo-Geneva) are largely the same game with the only differences being the cars available. The first two are Japanese & Korean only, while the third one was also released in PAL regions. The make up of the games is similar to Gran Turismo 3's arcade mode. There are 10 time trials which when passed unlock the respective track and some cars for use in a standard race. The game tracks completion and 100% consists of obtaining all the unlockable cars. This entails not only winning each race, but also beating the gold time for each time trial. The order in which things are done doesn't really matter. The fastest car is the original Castrol Supra and that's available from the get go. The one exception is for the rally races, Swiss Alps II should be done first. The Impreza Rally Car unlocked by winning it is faster than the one used to unlock it thanks to its default setup. The chosen order of tests/race is designed to minimize as much selection scrolling as possible. simple right to left order would be the best, however switching between Rally and Road races resets the car selection cursor. I did forget Autumn Ring forward so it gets out of sequence in the right to left order of road races. The Pace Car option before the time trials allows you to turn it on or off. Even though I often leave it behind after the first straight, the pace car is turned on for one or both reasons of slipstreaming it and being a better/quicker wall/brake for the first corner. The two real mistakes in the run are having it turned on for Midfield forward where it just gets in the way, and lightly tapping the wall at the exit of the first real corner in Swiss Alps forward which enables it to retake me and become a nuisance (it has more power than I do). As you can tell, opposed to Gran Turismo 4's pace car license tests, overtaking or crashing into it here isn't an automatic fail. The only way to fail these tests is to not meet the very generous bronze times. It's worth noting that with the pace car, these are still time trials and not races. The pace car drives fast enough to beat the gold time by staying close behind it throughout the lap. By knocking it off its course or delaying it, then even beating it is not a guarantee of gold. It doesn't speed up to compensate. None of the tests are particularly hard, the worst being Autumn Ring II and Tokyo R246 II due the NSX prototype and R35 GT-R being super slide-y and easily spun respectively. Unlike GT3's arcade mode, these games allow for a simplified subset of the normal tuning options available in the mainline games. As a bonus, and what makes doing it worthwhile is that the settings persist for the entire play session. At the start of the first race, I put soft tyres on the Supra which increases the grip available and let me corner faster. Driving on the green grass doesn't give as much grip as the road but otherwise there's no hindrance to speed or acceleration, so taking to it for tighter / straighter lines and to make the corners wider is a net gain. That's why I spend seemingly more time on it than the road around Autumn Ring. This is in contrast to the sandy stuff on Midfield/Autumn Ring which actively slows you down if you dip a wheel on it, and so it is avoided. While it may look from the minimaps like I'm in massively overpowered cars compared to the AI, I'm not. They're in cars of equal or even slightly better performance, at least in a straight line. Unfortunately for them, the straight lines of the Test Course aren't used in this game so they do have to take corners, and that's where the Impreza Rally Car especially makes up for any power deficit. If you're not familiar with Gran Turismo, much-worse-than-you-AI-in-similar-cars is a hallmark of the entire series. There is a higher, 'Ace difficulty' level but there is no greater challenge from the AI, it just increases the number of laps to five for road races and four for rallies adding around 22 minutes to the run for no extra benefit. After the credits I partake in the main gimmick of this spinoff series, the pod race. In such, as well as actual racing, you have to completely stop and put the handbrake on in the red area. This makes the car squat down, after which the text turns blue and you can continue on. Why this mechanic exists I don't know, but there it is. 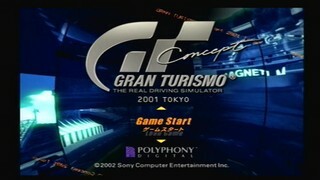 The timing of the run is the standard in the Gran Turismo community, starting at selecting Game Start and ending at the finish line of the last race that achieves the goal, here Midfield forward.